Thomas is doing pretty well. No real sickness yet. The drugs do make him sleepy, so he's been taking a second nap in the afternoon. That makes planning to go to the grocery store or on afternoon errands tough....and then he compensates by being up for an hour or two around 3 every morning. Putting him to bed later doesn't help -his p.m. meds make him drowsy, too. I'm sure we'll figure out a timing that works for us eventually. 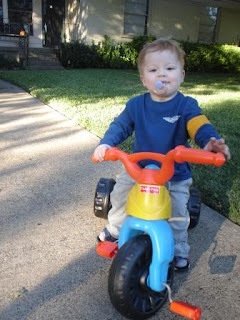 Right now, we're grateful that he seems to be feeling ok -- as you can see here on his birthday bike that he's finally big enough to ride on.